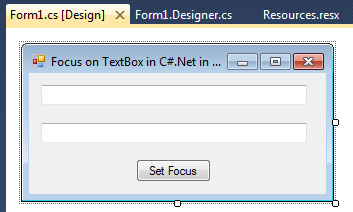 This article will show you how you can how you can set focus on textbox in windows application using c#.net. In this when we click on button the focus from one textbox to other textbox will shift. 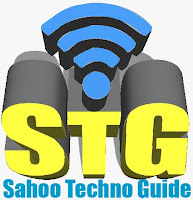 Some of my previous articles are as follows: Limit OR Restrict Number of Characters in Textbox C#.Net In windows Application, AutoSuggest DropDownList In Windows Application Using C#.Net, Random Character and String Generation Using C#.Net, Windows Application and Linq, Strong Random String Password Generation Using C#.Net, Login Form By UserType OR User Role In Windows Application In C#.Net , Linq, Display Message With Warning icon in Windows Application Using C#.Net, Stylish ToolStrip Button Control With Image and Text Control In Windows Application Using C#.Net, No of Days Between Two Dates By Using TimeSpan In Windows Application In C#.Net and VB.Net, Validate Directory Exist or Not in C#.Net In Windows Application. So for this article first we will create a new windows application and add the two textbox and a button control. After adding this we will add the below code on the button click. In above code check the bold part of the code. This piece of code will transfer the focus on textbox two. Now run the application and check the output.